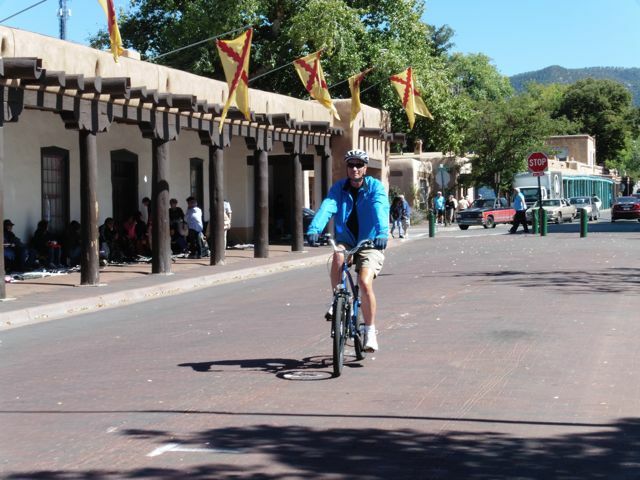 Santa Fe, everyone’s favorite southwest Spanish colonial cultural mecca, is a place to stroll and take in its unique ambience characterized by the recognizable Santa Fe style architecture, and highlighted by its delectably spicy southwestern cuisine. The sprawling capital city features a central historic core that is the main attraction to millions of visitors. The central plaza is now closed to autos – and to bikes as we discovered later. Come on Santa Fe! Plenty of quiet interesting streets to explore in the old town. 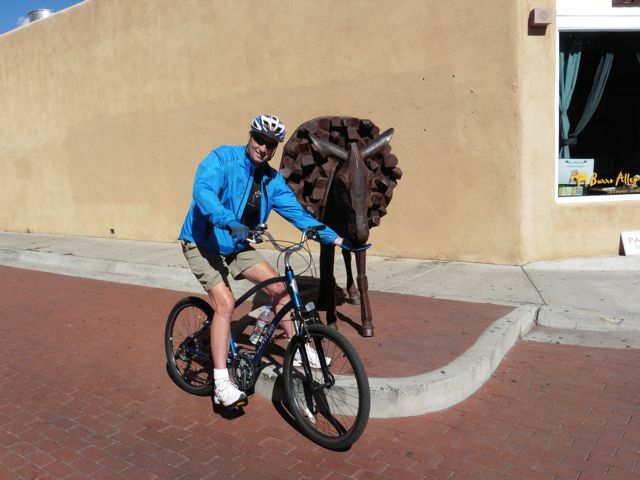 This is Burro Alley. Santa Fe’s cuisine is world renowned. 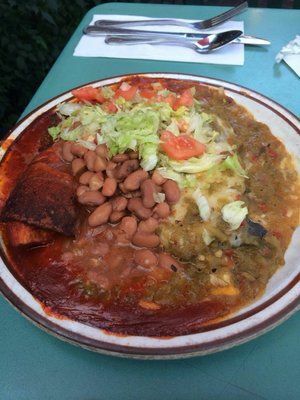 This Santa Fe style enchilada dish from The Shed where we had lunch today is a delicious example. 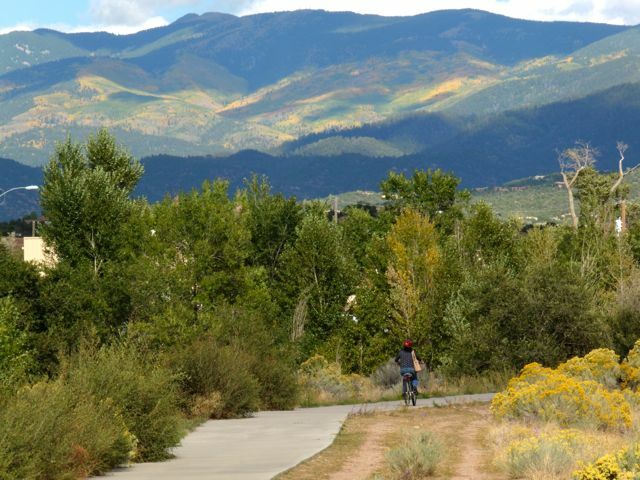 A paved rail trail starts at the restored Railyard District and extends south several miles, later turning to a dirt or gravel trail for another 10 miles or so. A short on-street route joins this trail with the River Trail, both close to the town center. 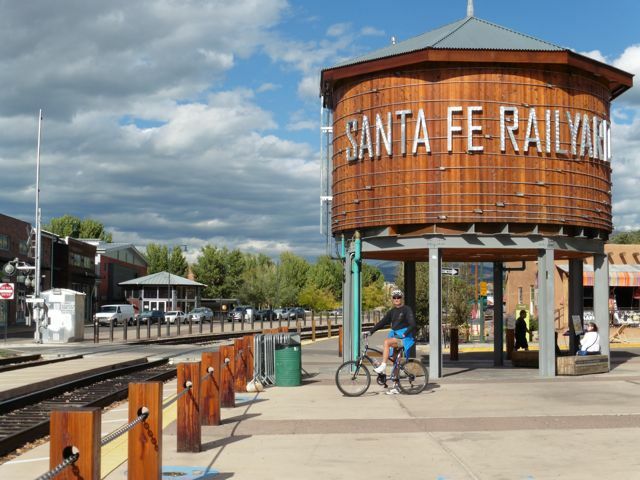 Santa Fe is restoring habitat along the Santa Fe River (more like a stream) and building a greenbelt that features the paved scenic River Trail, currently about 2.5 miles long. Note the yellow aspens in the surrounding mountains.